Otago High School Cadets, 3 years. David CARTER (father), Rock Pool, Pleasant Point, Timaru. Later of Mt Gay, Hazelburn, Timaru. Height 6 feet 1 inch. Weight 174 lbs. Chest measurement 35-38 in. Complexion fair. Eyes grey. Hair brown. Sight and hearing both good. Colour vision correct. Limbs and chest well formed. Full and perfect movement of joints. Heart and lungs normal. Teeth serviceable. Free from hernia, variococele, varicose veins, haemorrhoids, inveterate or contagious skin disease. Vaccinated. Good bodily and mental health. No slight defects. Admitted No. 23 Gen. Hosp, Rouen, 30 May 1916. 15 August 1916 in Royal Victoria Hosp, London, with pneumonia - progressing favourably. 8 September 1916 transferred (? )Netley hosp. to Brockenhurst. Wounded & discharged to duty July 23rd 1918. Wounded in action 26 August 1918 - gunshot wound legs, compound fracture both legs. Time in hospital suffering from severe shell-shock. Main Dressing Station of No. 1 N.Z. Field Ambulance, in the Field, France. Died of wounds received in action. II. B. 5. Pleasant Point Cemetery - General Section, Row 3, Plot 204. Robert Cecil CARTER was the third son of David Taylor CARTER, one of the oldest settlers in the Pleasant Point district, and Elizabeth Maud nee CUMMINGS, of Rockpool Farm, Pleasant Point. He was born on 19 February 1890 at Rockpool and baptized at St Alban's Anglican Church at Pleasant Point on 8 June 1890. In 1903 when a pupil at Hazelburn School, Robert qualified for an Education Board Junior Scholarship. He was educated at Otago Boys' High School where he was remembered by the Board of Governors at their meeting in September 1918. Prior to enlistment he worked as a farm assistant on the home farm. He left Timaru to go into the training camp in October 1915. He was one of a large group who were given a very enthusiastic farewell when they assembled in the drill shed for afternoon tea. The Ven. Archdeacon Jacob said that they were going to answer the call of duty and to help the brave boys who had gone before them and who were doing such splendid work. They were going to fight for King and country, to fight in the cause of right. They marched to the railway station, with the 2nd South Canterbury Regimental Band playing some soul-stirring patriotic airs. "Brave lads," said the Mayor in a voice broken with emotion, ". . .We are proud of you for the gallant way you have come forward to assist the Empire in its time of need, .. .You are going forward to fight .. for truth, liberty and justice." At Hazelburn in December 1915, a social and presentation were tendered to Robert and two others. The chairman congratulated them on their patriotism and he expressed the hope that they would come back safe and sound, covered with honour and glory. Robert was presented with a wristlet watch. After the singing of “For They are Jolly Good Fellows” he thanked the people for their present and good wishes. Robert was also given a pipe by the Hazelburn Relief Committee (of which he was a member), in the hope “that he would enjoy many a good smoke in the trenches”. Before leaving New Zealand Robert was promoted to corporal; three months later he reverted to lance corporal; just a week after he was appointed temporary sergeant, then again reverted to ranks. He left with the Canterbury Mounted Rifles. In Egypt he transferred to the infantry and went with them to France. In March 1916 Robert had to pay the cost of 7 shillings and sixpence for losing his hat. Suffering from severe shell shock, he was invalided from France to England in 1917 and hospitalized for some time. After a slow recovery he spent some months in clerical work at Codford before returning to France. On 23 July 1918 he was reported wounded and discharged to duty. Robert died of wounds on 27 August 1918, the very day he was admitted to the Field Ambulance. He had suffered gunshot wounds to the legs and compound fracture of both legs. 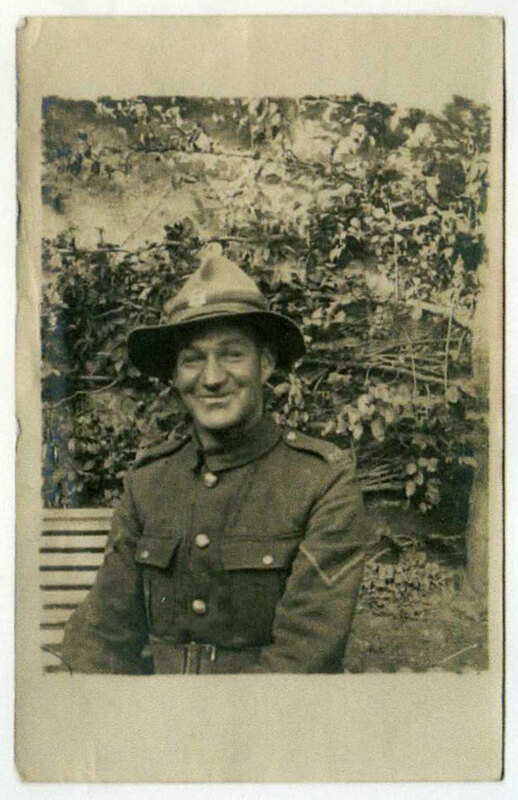 His father received a letter dated 6 September 1918 and bearing an Army Post Office stamp from Private John A. Walker, one of Robert's comrades-in-arms, stating that he was with Robert at the time of his admission to the No. 1 New Zealand Field Ambulance and that Robert died from wounds shortly after admission. News of his death was received with much regret in South Canterbury where he had spent most of his life. At an evening in honour of returned soldiers, held at Hazelburn in September 1918, the chairman moved a vote of sympathy and condolence to the parents of Corporal R. Carter who had recently given his promising young life for the Empire. Robert was very popular in the district, "his sterling character and bright, cheery disposition gaining him friends wherever he went." Also his example and record as a soldier won him high esteem. His brother David Roger CARTER was killed in action at Gallipoli in 1915. Two other brothers, James Quartly and Francis John, were listed on the Reserves Roll. By 1921 when Robert's plaque and scroll were sent, his father had moved to Mt Gay, Hazelburn. Advice of his medals was to be sent to his brothers Francis and James, his executors, and of Raincliff. Robert's will had been lodged with a solicitor at Timaru. He bequeathed all his real and personal property to his brothers and his sister Selina in equal shares. Annexed to the probate record is a certificate of death. The Carter family was active in the Hazelburn district, Mr Carter serving on school committees and Mrs Carter supporting patriotic funding through the Hazelburn and Raincliff Guild. Robert Cecil CARTER is remembered on the Timaru War Memorial, the Hazelburn District War Memorial and the Otago Boys' High School War Memorial, and there is a memorial plaque to Robert in St David's Anglican Church at Raincliff. .